Visual Studio projects not building anymore? So I checked the properties, every thing looked good. I even built the project from the command line and it built fine. Anywayz at some point after that I was able to debug the app. But then I noticed that the UI was not getting updated with my changes. So I started digging a bit deeper. I noticed that when I ran a Clean from Visual Studio the output files for that particular project. Build started 5/8/2010 1:10:02 AM. I immediately knew that there was an incorrect value in the build configuration manager. You can find the configuration manager from the toolbar. 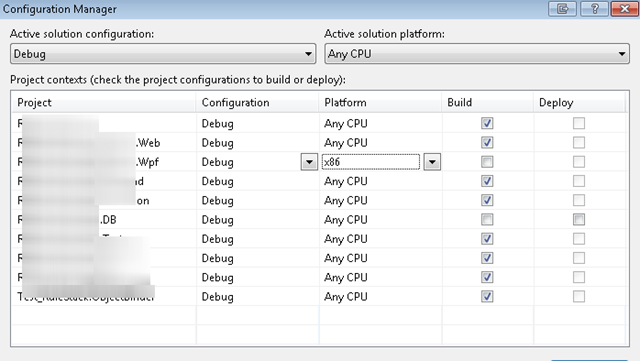 In this dialog there are two project set not to build for Debug builds; the DB project and the Wpf project. The DB project is OK to not build on Debug if there are a small % of DB changes versus code changes. If that is the case the devs can just build the DB project manually when the change it. In the case of the Wpf project, it should be set to build and the fact that it wasn’t was causing all the issues. So I checked the build check box, clicked the Close button and it was all good. You should also make sure that all other configuration as setup correctly. You don’t want to get bitten by this again.